After all the fall out from the final episode it seems odd writing about a new event in the LOST world, but here we are. 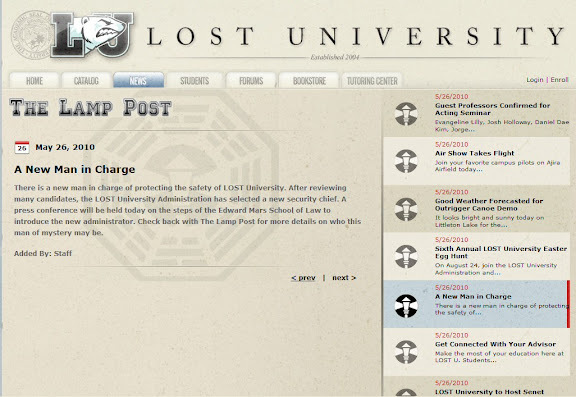 Earlier today Ray told us that the LOST University website was updated with several new news articles, however shortly after they were posted they disappeared again. If the news reappears, or if there is any other Lost University news we will let you know. thank goodness it's not until August...I'm still trying to catch up on my regular life now that Lost is over. Looks good though! Limbofunk, yes definitely a blu-ray set available. I would assume both ways. But I'm obviously not certain. I'm fiarly sure the site says somewhere it wil be on the sixth season discs for both the season on it's own and the complete set. We will have to check though. Glad to see it's moved away form the epic 500 post. Looking forward the Maters class. No idea what on earth it will entail. MAybe it's purpose is to answer everything we wanted answered maybe? Also, Amy Lynn, that Under The Sea song is perfect! Maybe we could all record a version of us singing it ! Most of the LU news articles are back, but not the one that is in the screenshot on the main page. Now it is, they must be updating on the fly. Are you serious? Because I'd love to hear that. AND I would record my rendition too, lol. I'd be happy to try, not sure how good I would do though. Hello, LostArgers. I've been mostly at TLC this year and I didn't do last summers viral poster thing, but THIS seems really interesting! I hope they find a way for those in foreign countries and even those without blu-ray to participate in this. I also hope I can finish my first degree (LOL, I ended up an LU drop-out). Amy Lynne, LOVE LOVE LOVE your song lyrics! The Lost University Lamppost posts are back up! What happened last time when things mysteriously disappeared and reappeared? That's right. NEW PRINT DROP AT LOST U! I just wanted to say that GoMerch is really on game with getting prints out quickly. The print I ordered 5/25/10 - Lost Live Jack - was delivered today! #295/300. It looks like Jack is very close to being sellout based on print number. @John W - that was awesome! :) very cute. Anyone know what the upcoming shows at G1988 are? Surprisingly I can't find anything further in their blog or website - usually he gives a pretty advanced heads up about stuff. I think I remember hearing there is a Danger show this summer, but not sure. No idea. My moss and danger both say preorder and my jin/sun says processing. My email is sarah_0901@live.com, please feel free to contact me. And again, sorry if this is the wrong place to mention this. @sarah, how many times are you going to post that here? The Candidate Cave - shipped Wednesday... received today. few pictures below. Loving GoMerch. From ordering to shipping, they nailed it this time around. Am I seeing that right? Looks like the number shows that it's an edition of 550, not 500 like it says on the DCAAPB store. I was expecting that the artists' 50 was included in the 500. I don't remember - I thought that for the first series the artists' 50 was part of the 300 they listed as the count on the site. I think I finally figured it out!!! The other post is purgatory and this post is the real world. All comments regarding Candidate Cave can be found in "Lost University - New Man In Charge" post. @John W. You're right on first series of posters. Artists' 50 was out of 300. On this run, DCAAPB indicates... "limited to an edition of just 550, with 500 available to the public through our website..."
@futureself - You're most welcome. The blue, orange & gold colors make this so print vibrant. Hi all- back on the plane heading home from LA. I love your creativity AL and John. Found myself in a bamboo forest yesterday of all places- so of course I had to look straight up and take a picture. Ah , Lost. I actually just came in here to ask for Zort's email to send him pics of my print. you are def. right... it looks awesome in person. Is anyone able to check the print quantities? I'm now thinking about getting a Tara Jin/Sun, but I would like wait to get some more funds if I have time. @JPL, the Cave looks amazing. Mine should get here soon. Hi all, been a quiet LOST day for me, but I've just put some details of what is in the Season 6 and Complete series collections on the main page. You've probably already seen the details in many other places, but I though it was worth showing the pictures. A few people have sent images of the candidate cave now, so I'll try and put some more detail about it in a mian post tomorrow. Thanks, Zort. I'm intrigued by the inclusion of the black light penlight in the Complete Collection. Hidden messages in the packaging, perhaps? @Zort thanks for updating the site with the DVD/Blu-Ray info. As always- you're always on top of it! @JPL - thanks for sharing your pics. :) I wish I had the wall space for them all. Just read the dvd content - very cool. That complete collection sounds awesome, but since I already have the dvds I think I will pass. Just recieved my Candidate Cave print today. It looks really fantastic in person. I am very impressed with it. If anyone is on the fence on this one I would advise to pull the trigger. And I can't wait to get that complete series box set, sure I have 1-5 on dvd (5 on bluray), but I can justify buying it as an "upgrade" of the dvds to blurays. And I know I would end up buying it anyway. Good lord have I spent a ton of money on a LOST. @comixguru - it's come down to rotating prints because of lack of wall space. One up. One down. Replace. Repeat. The dvd is a must. Like most, I have S1-5 (not on blu-ray), but will definitely be purchasing. The question is Amazon or wait to see if Best Buy has a similar price -special/exclusive offer as they've done in past.